One of the big puzzles in plant biology had been the mechanism which causes plants to flower when they’re subjected to a period of low temperatures. While the phenomenon, called vernalisation (also spells vernalization), was clearly a reality ‘ most obvious in winter crops and bulbs like tulips which flower only after cold weather ‘ its cause remained a mystery. During the 1990s, CSIRO scientists Jim Peacock, Elizabeth Dennis and colleagues established that vernalisation was an epigenetic control phenomenon and discovered the FLOWERING LOCUS gene. They showed that this gene operated in the model plant system Arabidopsis as well as in major crop plants. They also established that while the phenomena were similar the genes involved in the regulation of the flowering gene in crop plants differed in some respects from those operating in Arabidopsis. For their discovery of the FLOWERING LOCUS gene and its regulation Jim Peacock and Liz Dennis were awarded the 2000 Prime Minister’s Prize for Science. They attribute the success of their 30-year collaboration to the fact that they work in complementary disciplines, genetics and biochemistry, in one of the best plant research institutes in the world and with high level connections to plant-based industries. Since the latter years of the 19th century it has been known that some crop and horticultural species require a period of low temperatures so that flowering is induced in the spring. Clearly this is important for these species in that the remarkable transition from a vegetative state to a reproductive stage needs to occur in the best season of the year for flowering and seed setting, thus ensuring survival of the subsequent generations and hence survival of the species. This process, vernalisation, was studied by some gifted plant physiologists in the 1950s who really laid down the puzzling characteristics of this environmentally induced trigger for flowering. Early experiments had shown that it was necessary to treat cells that were actively dividing and that ultimately would give rise to the growing apex, with low temperature. The apex is the site of the developmental switch which changes gene activities from a pattern which forms leaves and other vegetative structures, to a new pattern which generates the reproductive structures of the plant ‘ the inflorescence ‘ with its accompanying individual flowers and ultimately the seeds of the new generation. Another important characteristic of the vernalisation response is that although the period of cold is remembered during the development of the plant, the whole process is reset in the next generation, which then requires another exposure to low temperatures to ensure flowering of that subsequent generation. These early experiments showed, apart from the fact that dividing cells were necessary, that the apex itself was important. They also showed that the extended low temperature period of winter was remembered by the plant ‘ even from a germinating seed ‘ through successive months to the developmental stage of the maturing plant when the switch to formation of the reproductive structures occurred. Plant physiologists in the 1950s and 60s showed that the increasing day lengths of spring were important in many plant species in triggering a response which was initiated in the leaves and then transported as message in the plumbing system of the plant to generate the changes in the apex to the reproductive phase. He and his colleague at CSIRO’s Division of Plant Industry, Liz Dennis, were struck by the similarities in the properties of the vernalisation response to the molecular characteristics associated with DNA methylation. They wondered whether the methylation decoration of the cytosine residues in DNA could provide a basis for the vernalisation response. One of the first experiments they did was to reduce the level of DNA methylation in the early stages of plant development by providing for the incorporation of 5-azacytidine, a nucleotide analogue of cytosine which prevented DNA methylation occurring. The reduction in DNA methylation substituted, at least partially, for the vernalisation treatment and generated earlier flowering than otherwise would have occurred in the vernalisation requiring species and ecotypes. This experiment, in both Arabidopsis and cereals, gave them hope that they were in fact touching upon the cellular and molecular mechanism behind vernalisation. The real breakthrough came when they turned to the genome of Arabidopsis. One of their first CSIRO colleagues, Jo Burn, apart from being involved in the methylation analysis established, as did another laboratory in Europe, that there were two key genes involved in the vernalisation response, FLOWERING LOCUS C (FLC) and FRIGIDA (FRI), but the molecular action of these genes was unknown. Another brilliant CSIRO Postdoc, Candice Sheldon, worked with them on isolating the FLC gene and showed that it produced a protein FLF (FLOWERING LOCUS F) which was a repressor of flowering. This locus was itself repressed in activity by the long period of cold. The removal of the repressor enabled flowering to occur at an appropriate time, suggesting FLC was the key mediator of vernalisation. They, and others, showed that a lot of other genes affected the activity of FLC. The breakthrough was the demonstration that the repression of FLC by vernalisation was due to an epigenetic control system. The chromatin of the FLC was chemically modified as a consequence of the period of low temperatures. In particular, key histone residues associated with transcriptional activity when methylated were reduced in frequency by the low temperature, whereas other residues, which when methylated were associated with lack of activity of the gene, were increased. This established the first system in plants which demonstrated an epigenetic control of gene activity in development, a phenomenon which had previously been thought to be restricted to the control of gene activity in the animal kingdom. Although their first data and conclusions were regarded with some surprise by the plant community, they generated a significant volume of research activity in many laboratories around the world. The genetic and epigenetic control of this major developmental switch from vegetative growing apex to reproductive growing apex has become one of the best known gene regulation systems in the plant kingdom. Two other major features of the control of flowering were also explained. One was the question of how the resetting of the requirement for vernalisation in each sexual generation occurred. Their research group showed that, following vernalisation, the restoration of transcriptional activity of the FLC gene occurred in the early stages of embryo development in the developing seed of the next generation. Remarkably, the resetting occurred only in the embryo and not in the adjacent tissue resulting from the fertilisation process ‘ the nurse tissue of the endosperm. Furthermore, they found that the FLC gene, when delivered by the pollen, was active even in the single cell zygote whereas the corresponding copy of the gene from the female did not show activity until a few cell divisions later in the globular stage of development of the embryo. 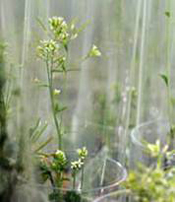 This story, which has been progressively developed by their laboratory and by other major laboratories in the US and UK, provided one of the major breakthroughs in the understanding of plant development and cemented home the realisation that epigenetic controls of gene activity are just as important in the plant kingdom as they are in different phylogenetic groups of animals. They then chose to look at the major food plants of the world, the cereals, where the importance of vernalisation was well known. For example, plant breeders had long known there were winter wheats and spring wheats, winter barleys and spring barleys. The winter varieties require the low temperatures of winter in order to have flower and seed development occurring in the spring and early summer, whereas the spring varieties have no requirement for vernalisation to provide for flowering. The characteristics of the cereal vernalisation-requiring varieties were parallel to those in Arabidopsis. The response to a period of low temperature could occur in the germinating seed and it was remembered through the development of the crop to lead to flowering in the spring, with subsequent seed development in the late spring and early summer. To their surprise they found that many of the genes involved in the vernalisation response were different to those in Arabidopsis. With new colleagues, they showed that the central VRN1 gene of the vernalisation response in cereals was induced to transcriptional activity by the low temperatures, in contrast to the FLC gene of Arabidopsis which was repressed by the low temperature period. They did find some comparable gene properties between the dicot Arabidopsis and the monocot cereals. The reduction in activity of FLC and the induction of activity of VRN1, the key gene of cereals in the response, both resulted in another locus, FLOWERING LOCUS T (FT), to be able to be induced by the onset of longer day lengths of early spring. This remarkable integration of plant responses to two quite different environmental cues has provided one of the major stories of plant development in modern biology. FT is repressed before vernalisation. The FT protein of the induced FT gene is transported from the leaves, and perhaps other areas of the plant where it is induced, to the growing apex of the plant to induce the remarkable change in patterns of cell division and subsequent aspects of development to generate the reproductive structures of the plant. The FT protein seems to correspond to the ‘florigen’ hypothesised by plant physiologists studying the role of the receptors of daylength in the leaves in the promotion of flowering. This research has put a molecular and cellular basis to this critical biological process of the plant and its interactions with environmental cues. Many plant species have similar vernalisation and daylength signals for their induction of flowering. For their work in the discovery of the Flowering Switch gene, Jim Peacock and Elizabeth Dennis were joint recipients of the 2000 Prime Minister’s Prize for Science, Australia’s pre-eminent science award. The prize is for Australian scientists who promote human welfare through an outstanding achievement in science or technology. The discovery of the Flowering Switch gene may help boost the productivity of the world’s crops by billions of dollars each year and could also help increase the nutritional value of crops eaten by billions of the world’s poorest people. Peacock WJ, Dennis ES, 2009, Personal communication.